Create the perfect setting for an extravagant dinner party with the Baytown 60" Angleton 7-Chair Dining Set. 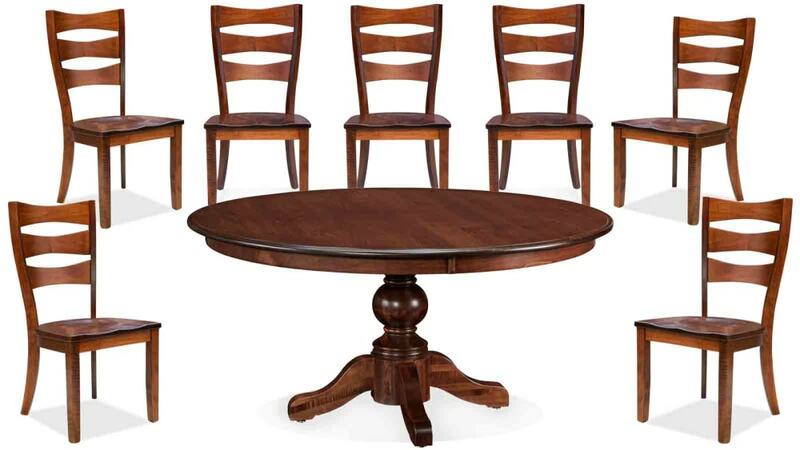 Amish-made, this solid wood set of table and chairs will be the center of attention in your kitchen or dining area. The sleek, shiny finish catches the light to spread a warm glow throughout the room. You'll find a new love for entertaining while showing off this fantastic find. Your guests will be undeniably impressed by the sophisticated nature of this American-made dining set. With seven seats, you will have plenty of room for all of your favorite people. This stylish dining set was made in America with expert craftsmanship. Amish woodworking gives this piece a traditional, classic look. The solid maple wood is smooth and sturdy. A strong pedestal base supports this table from the bottom up. Thumbnail edging completes the sophisticated look of the set. If you're searching for top quality, you've found it with the Baytown 60" Angleton 7-Chair Dining Set. With its solid maple wood craftsmanship, everything about this table exudes excellence. Start creating memories with friends, family, and guests when you add this set to your furniture collection. You can be confident that it will be there for you in the many years to come. Invite your guests over TODAY, because you won't have to wait for this dining set to arrive on your doorstep. With same-day delivery, you'll be able to update your dining area in no time at all. Invest in quality and you'll never look back.